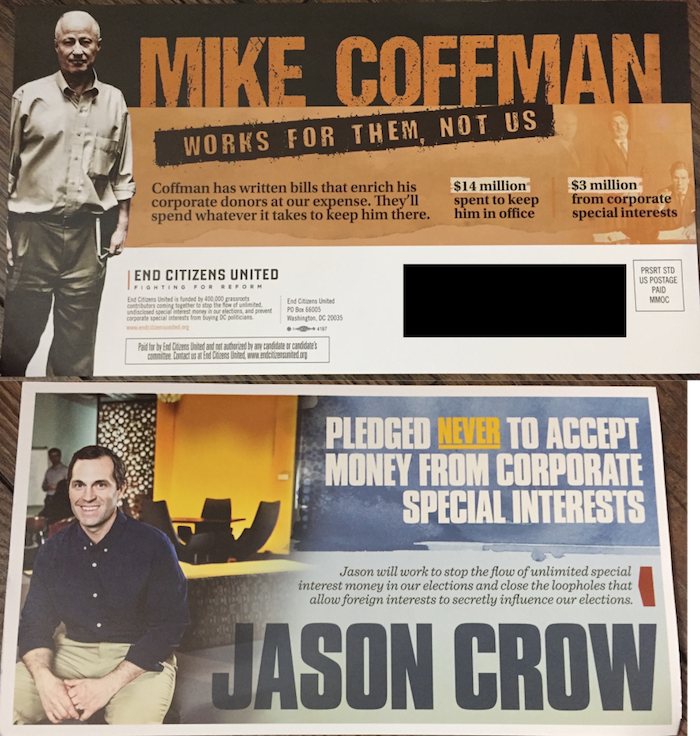 This mailer from super PAC End Citizens United says Democrat Jason Crow isn't a career politician and won't take money from special interests on one side. The other side presents a gray photo of GOP incument Rep. Mike Coffman, saying he "works for them, not us." It notes that $14 million has been spent to keep Coffman in office with $3 million from special interests. This is a more accurate portrayal of Coffman's campaign finance sitaution than the group has made in the past. About the messenger: End Citizens United is a political action committee supporting Democratic candidates who support ending the 2010 Citizens United Supreme Court decision, and supporting campaign finance reform to get big money out of politics. The messenger's money: More than 400 Coloradans have donated nearly $156,000 to the PAC.